One of the bonuses of visiting Prague in the winter are the Christmas Markets. We don't have these outdoor markets where we come from in Canada (most likely due to the weather) and we missed out on the Christmas feeling last year as we spent the holidays in Gabon so both of us were really looking forward to getting into the Christmas spirit. 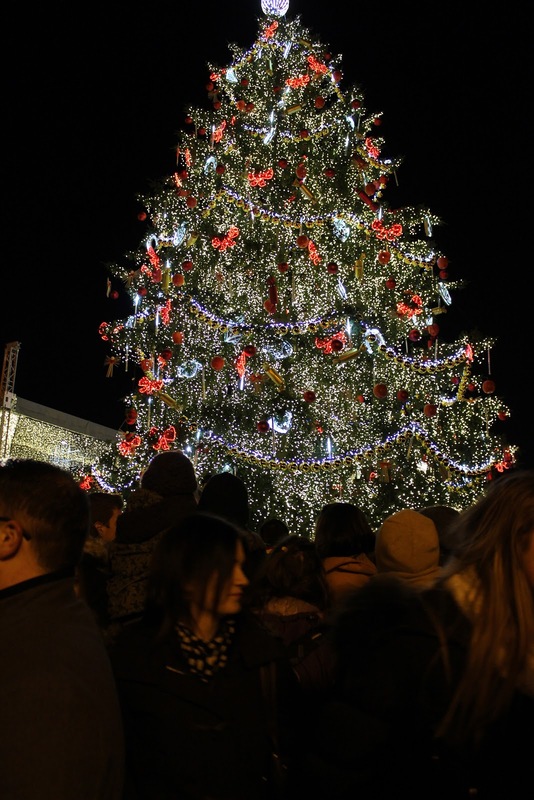 While they were setting up the market in Old Town Square when we arrived in Prague, the kickoff was Saturday evening with the lighting of the tree. Having spent the afternoon on the other side of the river, we followed the crowds back to the square just after dark. There were literally thousands of people trying to find a spot around the large tree; children bundled up in snowsuits, ready to be hoisted onto their parents' shoulders, young couples holding hands and tourists all taking part. Eventually, the lights in the square were dimmed and a few minutes later, the tree lighting ceremony began, set to instrumental music. It was a bit of a spectacle with different sections illuminating to the music until finally, it all culminated in the entire tree lighting up to the cheers of the crowd. Hot wine, beer, old Prague Ham, freshly made potato chips and my personal favourite, the trdelnik were found throughout the market. At 50 czech korunas ($2.50) we couldn't afford to turn anything down and even skipped dinner twice just to snack. I couldn't count how many of these delicious pastries I consumed over the course of our stay in Prague. Dough wrapped around a stick, roasted over hot coals and then seasoned with sugar and cinnamon made the perfect treat at any point in the day. 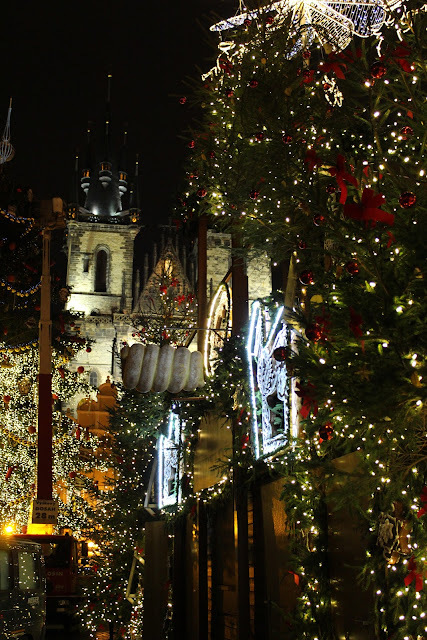 It was the perfect start to December and the Christmas season and great to see Prague in festive spirits. So pretty. Are the holidays less commercial over there? It's still pretty commercial however, not quite to the extent that we have in North America! This looks so magical - must have been such a neat thing to witness :) AND those pastries look divine! I agree! The best snack! I do believe I skipped a few dinners for these, too! Beautiful pictures. Wow how gorgeous!!! I'm so planning to spend the holidays in Europe next year, if only for the Christmas markets! I look forward to seeing more about Prague! What wonderful shots! We enjoyed some Christmas markets in London but they just weren't as good as the ones in central Europe.